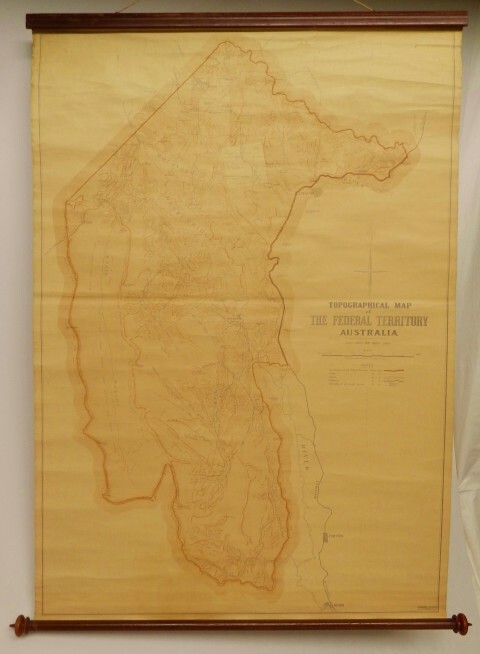 Topographical map of The Federal Territory (Canberra) Australia | Jenkinson Antiques - an ever changing cabinet of curiosities! This map was compiled drawn and printed at the Department of Lands, Sydney, N.S.W. and is dated 1910. It is printed on paper and mounted on linen on a cedar roll by the map mounter J.Creffield, Melbourne (established in 1888). The map contains the proposed site for the Federal city of Canberra and includes notes for future infrastructure. The federation of the 6 self governing British colonies in Australia occurred on January 1, 1901, when the constitution of Australia came into force. The site of the Federal capital was hotly disputed between Sydney and Melbourne, with the result that a separate territory (The Australian Capital Territory) was established within N.S.W. to hold the new capital, known as Canberra (popularly "meeting place" in the local indigenous language, or as John Gale in the 1860's suggested, the anglicised version of the native word meaning "the hollow between a woman's breasts", an analogy referring to topographical details). George Sydney Jones first suggested a competition to design the Federal capital in 1901. The minister of Home Affairs, King O'Malley, approved an international design competition in 1911. The process was fraught from the start, because O'Malley wanted the final say on the design. The Royal Institute of British Architects ruled that only qualified architects should judge the competition, and advised their members, including those in Australia, not to compete, thereby excluding some contenders. The Department of Home Affairs ran the competition, and two maps were produced for competitors: one is for sale here, the other described as the "proposed site for Federal City" and it's position is shown as a lighter square in our map.. In the end the judges, such as they were, had to consider 137 entries. Judging began in March 1912, with Walter Burley Griffith, architect and landscape artist of Chicago, Illinois, declared the winner by a majority of judges. O'Malley, himself an American, confirmed the worst fears of architects when he said on the 24th of May 1912, that he would be justified in taking design elements from various plans to cobble together an outcome. The Sydney Morning Herald, 3 days later, called it a "hotchpotch plan". The bureaucratic interference Griffith encountered was the subject of a Royal Commission that found his authority had been usurped by the Australian authorities. The project was underfunded and in 1920 Griffith was fired and little had been achieved. The "village" of Canberra became a national embarrassment, and it wasn't until 1957 that development in earnest began, incorporating some of Griffith's designs, and plenty of hotchpotch. The saga of incompetent bureaucrats meddling with designs was soon to be repeated with the Sydney Opera House competition, but that's another story. "Sydney: Dept. of Lands. 1910. 1 map on 2 sheets, 123 x 86cm, on sheets 72 x 90 cm and 59 x 90 cm. Notes: Topographical map of the Australian Capital Territory showing roads, rivers and railways, description of the countryside and proposed site for the Federal city. Relief shown by hill shading and spot heights. Also issued for the Dept. of Home Affairs, in 1911, for Federal Capital Design Competition competitors"
The condition of the map we offer is overall good to very good, with some slight creasing and a light stain to the very bottom of the map, and a few ink marks to the upper RH edge.